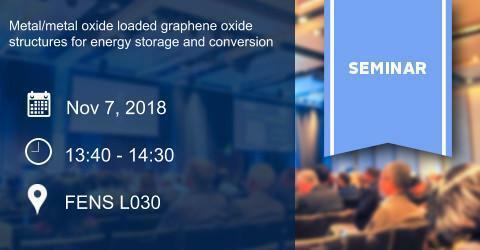 Abstract: Graphene-metal/metal oxide composites combine excellent electrical conductivity and mechanical strength of graphene with inherent catalytic activities of metal/metal oxides. These composites exhibit significantly higher catalytic/electrochemical performance than their individual counterparts because of the ‘synergistic effect’ between graphene and metal/metal oxides. We have utilized different techniques to produce graphene-metal or metal oxide composites in different forms like aerogels, self-standing membranes or thin films. The composites were used in catalytic reactions, or supercapacitor applications. For example, Pt nanoparticles were dispersed onto graphene aerogel through ex-situ deposition techniques. The resulting high surface area aerogels decorated with Pt nanoparticles showed excellent electrochemical surface area and ORR performance outperforming the porous graphene supported Pt in the literature. On the other hand, MnOx nanoparticles were electrodeposited onto self-standing graphene papers at room temperature. These composite papers annealed at different temperatures exhibited excellent cyclic stability in Cyclic Voltammetry measurements. In addition, we have revealed the structure- property relation in thin films of graphene and iron oxide nanoparticles deposited with layer-by-layer technique. Herein, I will demonstrate results from our work on graphene oxide aerogels or papers decorated with different metals or metal oxides. Bio: Ugur Unal has received his Ph.D. from Applied Chemistry and Biochemistry Department, Kumamoto University, Japan in 2004. He worked as postdoctoral associate at the same department between 2004 and 2007. Then, he joined to Koc University Chemistry Department in 2008. He received Japanese Government (Monbusho) Ministry of Education, Culture, Sports, Science and Technology scholarship and Japan Society for the Promotion of Science (JSPS) postdoctoral fellowship awards. His current research interests are 1) Synthesis and applications of nanosheets of 2D layered materials, 2) photocatalytic energy conversion 3) electrochemical synthesis of thin films 4) synthesis of advanced ceramics for optical applications.